Prime Minister Voreqe Banimarama was present at the Diamond Jubilee celebrations for Lautoka Delana Primary School yesterday. He was the chief guest at the event which attracted a large crowd of students, ex-students, staff, teachers, parents, friends and supporters of the school. 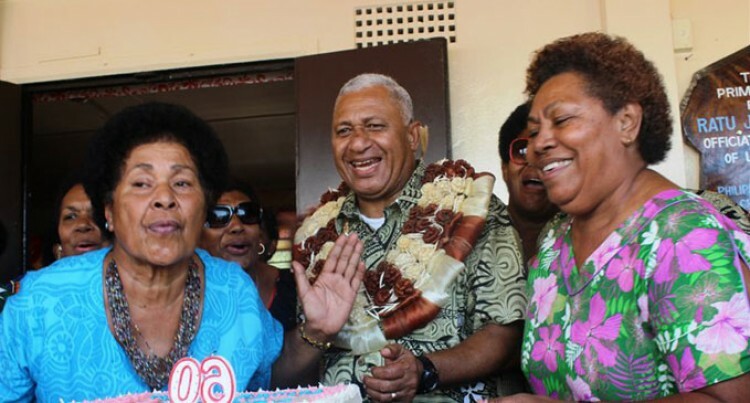 Mr Bainimarama said he enjoyed being part of such functions where the education system was celebrated along with students. He was welcomed with cheers which continued throughout his message as the crowd acknowleged initiatives implemented by the current government. All Primary and secondary school students enjoy free textbooks and bus travel as introduced by the present Government. “This is what we have done over the past few years, and if I am voted into power again, there is much more in store,” said Mr Bainimarama. “These schemes ensure that we can have smart students and this will result in a smart country. “If we are voted for in the next Parliament, my government will work hard to improve the education systems,” he said. This he said, would lessen the burden of parents and at the same time ensuring a better future for the children of the country. He said FijiFirst’s manifesto would ensure that all preschool education will be free of cost. The Fiji First party leader said in the party manifesto, all Year One students would receive 250ml of free milk everyday of the school year. “This kids need to drink milk at all times and to move ahead and be smarter than us,” he said. He said the scholarship schemes by the government also ensure equality in the education system. He urged the students present to study hard and to try and make it to the 600 Toppers list for full scholarships.